Early in November, a couple noticed an unfamiliar dog roaming the streets of South Texas neighborhood. Weak, severely malnourished, with skin ravaged by mange, the pup was dire need of help. The couple tried to coax her for a while, but the poor pooch was too scared and refused to be caught. Ana, as she was named later, finally found help a week later and she was immediately taken to the vet’s office. Looking past the horrible scabs, the people who rescued her find out that she’s only about a year or two old. 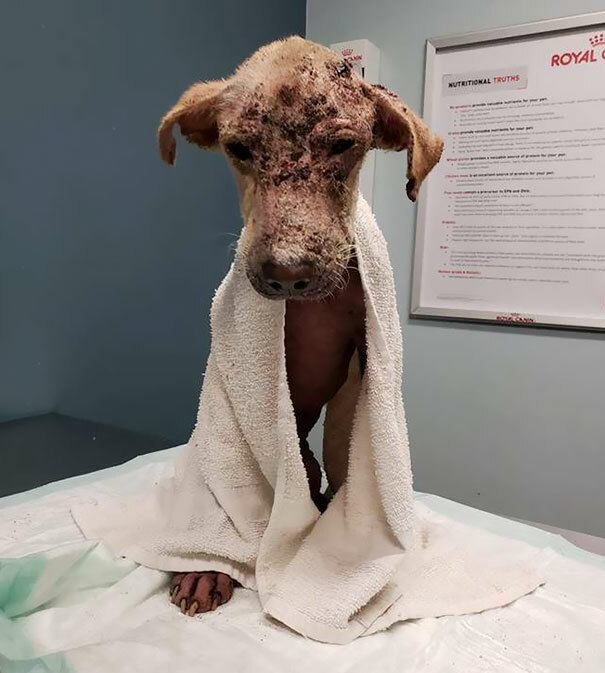 As her health was in an extremely poor condition, Ana’s chances were very low, and even the founder of Rescue Dogs Rock NYC, Stacey Silverstein, didn’t raise her hopes up.